New Delhi: In stark contrast to the fears of economic slowdown hurting the country’s labour market, two separate job market surveys today suggested an improving employment scenario and predicted robust hiring activities for the new year - which could be the best in the world. Painting an optimistic picture, global HR firm Manpower said in its quarterly job market report that Indian employers are the most bullish globally when it comes to hiring, with robust recruitment plans for the next three months - the first quarter of the new year 2012. 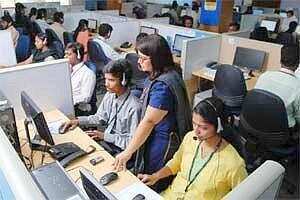 In a separate monthly report, job portal Naukri.com said that hiring activities surged in November across all sectors. Against the backdrop of contraction in industrial output and gloomy economic growth prospects, concerns are rising that such situation could seriously hurt employment in the country. The Manpower Employment Outlook Survey revealed the outlook has improved in six out of seven industry sectors for the March, 2012, quarter, compared to previous three months. As per the report, the services sector (+49%) and mining and construction sector (+47%) present the brightest hiring opportunities for job seekers in the next three months. Meanwhile, the monthly Naukri Job Speak index - an indicator of online job demand - showed that hiring activities moved up across all sectors last month from the levels seen in October, signalling a “seasonal spike". Expressing concerns over declining industrial output, industry body Confederation of Indian Industry (CII) yesterday said that any further contraction “would have serious consequences on employment and livelihoods." Industrial output contracted 5.1% in October, the highest decline in more than two years, mainly due to steep decline in production in manufacturing, mining and capital goods sectors. The government also recently lowered its GDP growth forecast for the current year to 7-7.5%, from 9% previously, fuelling concerns about a slowdown in economic expansion and the subsequent impact on job market. However, Manpower India managing director Sanjay Pandit today said that hiring plans would bounce back after a slight decline in final quarter of 2011, despite uncertainties in global markets. “... Employers in India are anticipating a vigorous hiring pace in the next quarter. This trend is being led by the IT, banking and manufacturing companies, especially multinationals and large national corporations, which are planning to hire aggressively in the first quarter of 2012," he pointed out. A survey by the recruitment tendering platform MyHiringClub.com, released yesterday, also showed that job market is expected to see increased hiring in sectors such as infrastructure and information technology in the January-March quarter of 2012. The survey, which was conducted among over 4,000 employers, found that all nine sectors and all four regions of the country have positive hiring plans for the next quarter. “Job seekers will be going to get more opportunities as our data shows the India’s employment markets will experience recovery in the fourth quarter. The good news is that many markets appear to be heading in the right direction," MyHiringClub.com CEO Rajesh Kumar said.